Modern day research practice is incredibly collaborative, increasingly interdisciplinary and a very social process. Sierra Williams underlines the importance of researchers and publishers alike recognising publication as one aspect of a much wider social process. By way of introduction to her role at peer-reviewed open access publisher PeerJ, she reflects on the purpose of community in science communication. Where do publishers fit in science today and how are they supporting scholarly communities to ensure they thrive? The fact that these questions are asked so regularly these days – often in tandem – suggests a few things: One, the research landscape in the digital age is (still) somewhat unsettled. And second, the direction and trajectory of science today is embracing more of a community ethos. 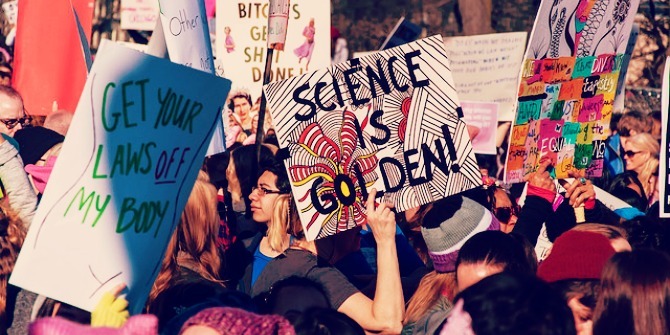 We don’t really have to look far to recognise the growing reach of these community efforts in action: March for Science events being planned around the world, ongoing citizen science projects, reproducibility initiatives, and open access publishing come to mind as shining examples. Image credit: Women’s March Chicago by bradhoc. This work is licensed under a CC BY 2.0 license. I’ve recently started working for PeerJ as their Community Manager and am interested in the many different axes of support scholarly communities require today. As I work towards engaging different communities to consider open research practices in general and PeerJ specifically as a quality open publishing option, understanding the intersections of different community efforts and where further attention should be placed will be instrumental. Last week I had the chance to hear more from researchers about their own community efforts at the University of Reading’s Open in Practice event. The event was organised to encourage wider discussion and awareness of open research practices amongst researchers and brought together perspectives on openness from the sciences and humanities. My talk looked at Openness Across the Research Lifecycle and whilst it was more focused on open access options for traditional journal articles, I also looked to situate some other open research practices like open peer review, preprint sharing, data sharing and blogging. Given PeerJ’s strong position as a quality peer-reviewed open access publisher for biology, medicine, and computer sciences, increasing transparency in the publishing process through PeerJ Preprints, a rigorous data sharing policy, and optional open peer review, this was all pretty straightforward. Discussion afterwards included some interesting insights and perspectives from researchers on how to encourage wider uptake of open peer review, recognising and rewarding the contributions of both peer reviewers and data sharers, and emerging vulnerabilities and opportunities of openness for researchers working in politically volatile areas (i.e. climate change). Fundamentally, the point of my presentation was to look at what a more engaged and open scholarly community means for science today. A thriving science community has meant more attention from researchers, university leaders, funders and librarians on getting the most out the research process itself. With the stretched nature of research budgets, a spotlight has rightly been placed on what publishers offer and what they add to the scientific enterprise as a whole. This scrutiny has been instrumental for wider innovation and also has resulted in new models and new experimentation forcing movement in the otherwise glacial pace of change in academic publishing. Publishing is obviously a very important aspect of research communication, but often its value is hidden behind academic incentive structures, editorial models and funders’ policies. At the end of the day, scientists have to feed their families and publishing papers is intricately bound to this – the “publish-or-perish” culture remains pervasive. But publication, or the act of making research public, is valuable to the scholarly community not just because of the doors it opens to individual researchers, but because it explicitly recognises and re-affirms that science is a social process. From researcher collaboration to preprint feedback, from peer review to readership numbers – the scientific article is all about facilitating social interaction across the scholarly community and beyond. Modern day research practice is incredibly collaborative, increasingly interdisciplinary and a very social process. Part of why openness is so valuable and perhaps also so complicated is because of this social element. Martin Eve has touched on these complications in his post on credit and hidden labour in scholarly communication. Publication is one important aspect of the social process of science, but research extends beyond that. The communication and impact of research today involves many different audiences and mechanisms for reaching these audiences. My co-authors and I provide a framework for understanding research communication today which we call the Research Lifecycle framework in our book Communicating Your Research with Social Media. 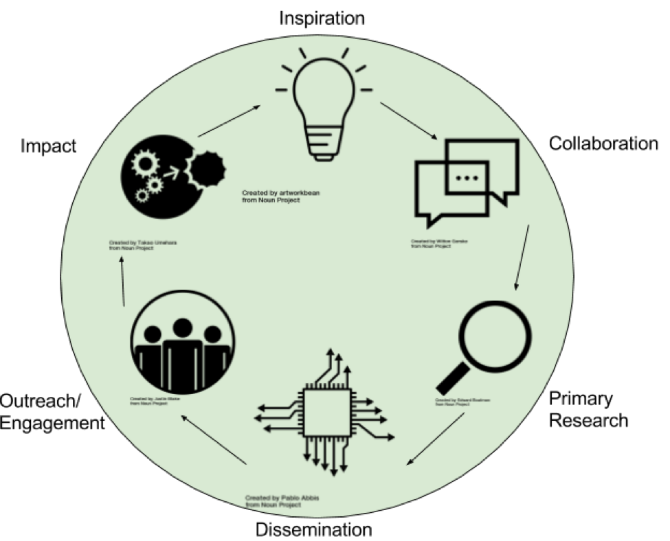 Research lifecycle diagram. Image credit: Sierra Williams (CC BY). What I enjoyed most about the Open in Practice event is that often these conversations on scholarly openness tend to focus on individual players – researchers, funders, librarians, publishers, etc. – and their different responsibilities. This event looked to start from a position of shared responsibility to encourage wider open practices for the benefit of the scholarly community. We can discuss issues related to reproducibility in science to the end of time, but unless researchers, higher education administrators, librarians, funders and publishers are recognising a shared community goal, we’re not really going to get very far in improving the scientific enterprise. We’ll just continue to pull in different, if still vaguely aligned, directions. 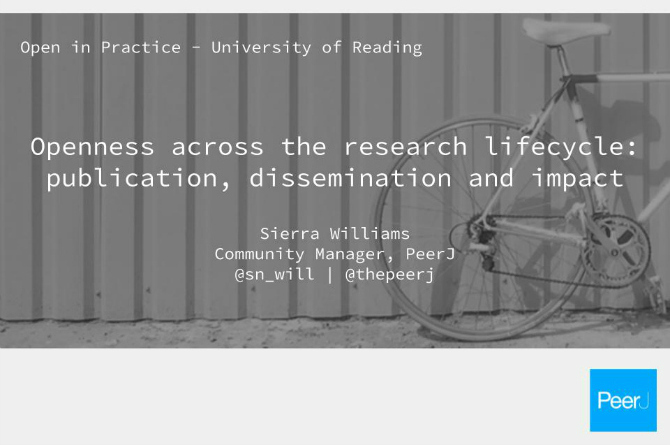 If you are interested in putting together an event for researchers at your institution on open research practices, do get in touch on Twitter @sn_will or sierra.williams@peerj.com. The University of Reading is an institutional member of PeerJ – visit the University of Reading institutional page for more info. For more on the social nature of research and using social media to communicate your research findings look out for Communicating Your Research with Social Media, published later this month. This blog post originally appeared on the PeerJ blog and is republished under a CC BY 4.0 licence. Sierra Williams is Community Manager at PeerJ, the peer-reviewed open access publisher of research in the life sciences and computer science. She was formerly Managing Editor of the LSE Impact Blog. Sierra is co-author of Communicating Your Research with Social Media: A Practical Guide to Using Blogs, Podcasts, Data Visualisations and Video. She tweets @sn_will.